Blog / Quote Online. Order Online. Build Your Business. Getting started with online ordering usually only requires that you provide little more than basic contact information. Once those details are provided, your account verification and activation generally takes a few business days. This may seem like a long time to some—particularly in comparison to those e-commerce businesses that allow almost immediate account activation and even ordering by guests without accounts. However, instantaneous account approval methods often don’t allow for the customization and specialized pricing like ABC’s do. If you’ve already ordered from a retailer offline, historical account information is typically linked to your new online account. This generally also includes any unique pricing agreements. Of course, sensitive account information is kept safe using appropriate online security methods and password protection. These features are vital to keep everyone’s mind at ease when doing business online. The biggest benefit of online ordering tools is often the convenience of getting quick, accurate, pricing information anytime. 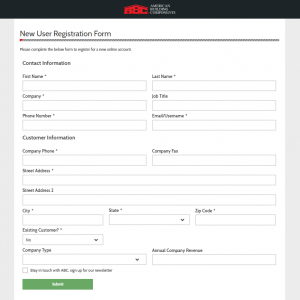 When a quote is sought for a project of any size, customers can simply log into their online ordering account and view up-to-date information related to all of their quote queries and order transactions. Some online ordering platforms like ABC’s even include a “Quick Price” tool. This enables users to search for specific products and set customized attributes for them to get an accurate price for that item immediately—all based on either unique or general pricing agreements. An added bonus: when changes are made to pricing agreements, quotes and preferences, they can be seen in real time. While online ordering is inherently faster than more traditional processes, these tools help speed up the process even further. Once you’ve customized the products you need and added them to your cart, you are ready to checkout. Online ordering makes this easy by providing fields that capture all necessary information like shipping address, delivery instructions, jobsite contact and more to help prevent delays in material delivery. In addition, a variety of payment methods are often available. These include purchase orders and even credit cards, allowing you to select the method you prefer best. Once you’ve set your preferences, your account remembers them, helping you reduce the repeated entry of rarely-changing information. Anytime you need to know the status of an in-progress or already-completed order, a quick glance at your online account should provide all the information you need. In most cases, checking an order status is done by simply clicking on it to view details like the order confirmation and shipping status, which can also be easily shared with colleagues. assign customers to specific employees within a sales team. With benefits like those listed above, it’s no wonder that businesses are transitioning to this digital means of operation. 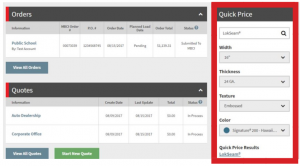 To find out more about how ABC’s online ordering tool can help you quickly create quotes with accurate pricing, order the products you need to start building, and save time so you can focus on your business, watch this video. You can also visit http://www.abcmetalroofing.com/SHOP/ or contact your local ABC representative for more details on how to get started with your own online ordering account.